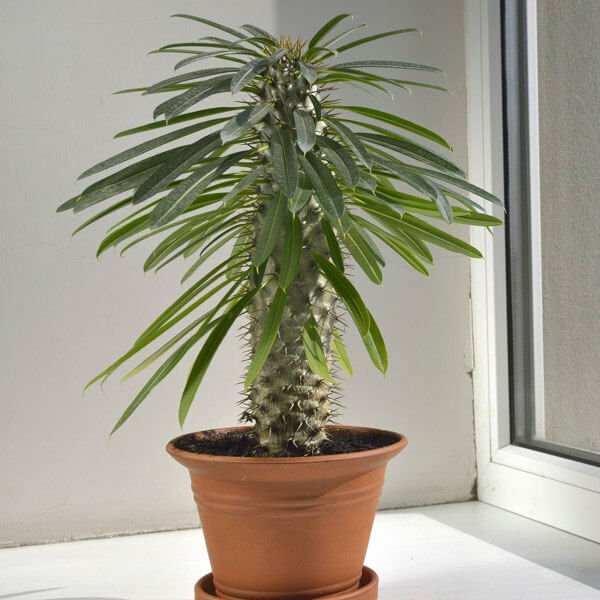 Madagascar Palm (Pachypodium lamerei) a succulent shrub or small tree. It has a tall, silvery-gray trunk covered with sharp spines. Long, narrow leaves grow only at the top of the trunk, like a palm tree. Plants grown outdoors will reach up to 20 ft, but when grown indoors it will slowly reach 4 – 6 ft tall. Plants were grown outdoors develop large, white, fragrant blooms at the top of the plant. They rarely bloom indoors. It thrives best in warm climates and full sun. Cactus potting mix works well to provide fast drainage. Or you can use 2 parts all-purpose potting mix with 1 part sharp sand or perlite. Water thoroughly and allow top half of soil to dry out between waterings. In winter, water sparingly just to keep the soil from drying out completely. Plant in a pot with drainage holes to prevent root rot. It prefers average room temperatures 60°F – 75°F / 16°C – 24°C. If you move your plant outdoors for the summer, don’t worry, it can take the heat. Just bring it back in when the temperature drops. Madagascar Palm requires average indoor humidity, around 40% relative humidity. Fertilize with a cactus or succulent fertilizer in spring and summer. It can be easily propagated by seed. Sow seeds in spring. Offsets can be cut away from the parent plant and potted up separately. Madagascar Palm has no serious pest or disease problems. Watch for aphids while flowering.